It’s strange to read this poem again, now that my sons are grown up. I wrote this eight years ago! More of my weather sonnets are in my chapbook Cloud Studies. half-formed and blurry in the shifting mist. that clarity is understood, not seen. his fingers as I watch him laugh and frown. when growing up still feels so far away. Every two years my younger son must go to the hospital for tests. Today, we drove down to the Children’s Hospital of Philadelphia, and I am tired and happy, because he is fine. His echocardiogram, EKG, and stress test show that his repaired congenital heart defect is completely stable. All that’s left from the terror of his first few months is a minor heart murmur. Every other year I worry (so far, needlessly). And this year, when we came home, we discovered that one of the colleges to which he’d applied accepted him for autumn of 2015. Today’s high temperature was 70F—at the end of November. Spring has sprung at the tail end of autumn, but we know that there is snow coming for Wednesday. What does that mean? Probably nothing, but my brain keeps trying to create patterns from random events, like a broken clock still chiming the noon hour, long since past. Several years ago I wrote a poem that feels exactly like today: Iridescence. It was published in my sonnet collection: Cloud Studies (you can read the entire collection for free, or listen to the delightful Nic Sebastian read them to you, right here). You are not to blame. We separate. the slippery shore. Angels come too late. can you see the rainbows in the sky? your dreams safe, my little boy. Just sleep. 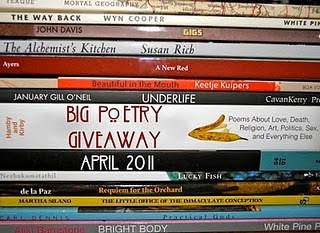 Kelli Russell Agodon started this nifty project where a bunch of poetry bloggers get together and give away poetry books for National Poetry Month! The idea was so cool I decided to participate. 1. 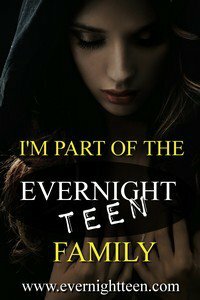 I’m giving away two books. If you want to win these books, please leave a comment on this post with a link back to your blog/website OR leave your email address (if you don’t have a blog/website). The giveaway runs from now until April 30. On May 1, 2, or 3, I will be randomly drawing one name from the list of people who commented and that person will be the winner! I will mail two poetry books to you for free! 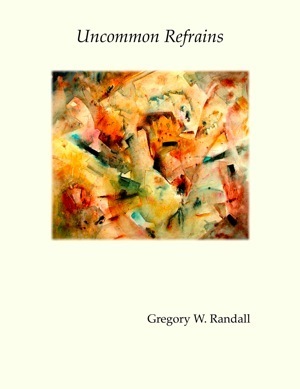 Uncommon Refrains by Gregory W. Randall, published by The Lives You Touch Publications. Why this book? Because it’s fantastic. I wrote a review of this book a little while ago—to read it click here. 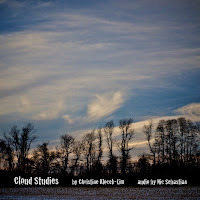 Cloud Studies – a sonnet sequence by Christine Klocek-Lim (yeah, that’s me), published by Whale Sound Audio Chapbooks. Why this book? Because Kelli says to give away one favorite book of poems, and then give away one of your own. This book is available free on the internet, but Whale Sound also published a print version and I’d like to give someone the opportunity to hold that in their hands. It’s a book of sonnets. If you’d like to read Nic’s process notes about my chapbook (she’s the editor/publisher), click here. 2. A little note about myself: I’m a poet. I’m really terrible when it comes to writing about myself, so no clever bio here. I’d love to say that I’ve worked in the circus, been a professional surfer, or lived on the Appalachian trail for a year with no shelter, but alas, I’ve done none of those things because I’m afraid of heights, hate to swim, and there is no way I’m going to live in the woods with no access to a porcelain tub for longer than one night. However, I have been a technical writer, an editor, a proofreader, and a novelist. I’ve won a few awards and had some stuff published a few places. 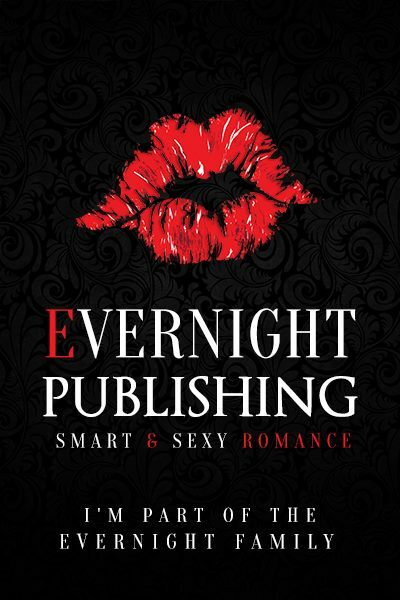 If you’re really curious, click here for my bio and here for my list of publications. Audio Chapbooks? Why yes. At Best American Poetry. poetry out loud: audio chapbooks and other methods of poetry delivery [by Nic Sebastian] at Best American Poetry. Lest you think all that Nic does is publish other people’s poetry at Whale Sound, please to be clicking through to see her brand new poetry collection: Forever Will End On Thursday. Fantastic work Nic! I’m thrilled to announce that Whale Sound has published my collection of sonnets, Cloud Studies, as its third audio chapbook. Working with Nic Sebastian was incredibly rewarding. She is an excellent editor and a sublime reader. And there’s so much new with the audio chapbook format! Whale Sound Audio Chapbooks is offering some new options to the poetry consumer with the publication of Cloud Studies. The central question for the poetry consumer we have been asking as a publisher remains unchanged: How do you like your poetry served?